On the Google Keyboard on Android, if you hold down on a key, a small menu will pop up with variants of the symbol pressed. For example, holding the 'a' key will provide options of æ, ã, å, ā, à, á, â, and ä. Holding the '?' key will provide the ¿ symbol, presumably for Spanish users. Some of the other symbols, however, have some rather... odd choices. 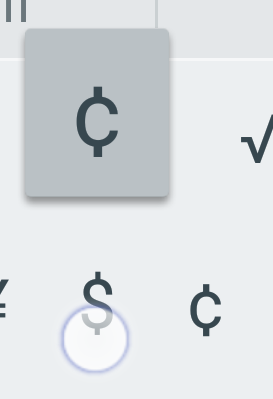 Do you want to type the ¢ sign? Sure, we've got two options for you - press the cent key, or hold the dollar key and we'll give you a cent there too. On the symbols page, holding the • (bullet) will give the following nonsensical options. What on earth were they smoking? I've recently been using a Mac with a non-Apple (i.e. Windows) keyboard. This was not a fun experience when getting started. Firstly, of course, I had to work out how the hell Ctrl/Win/Alt map to Control/Cmd/Option (and I'm still not 100% sure, I'm just kinda winging it). Then I tried to get it to treat the keyboard as a UK layout. Turns out you can't quite do that. Even going through the keyboard layout options and ensuring it's a "British - PC" ISO layout, it doesn't map all of the keys correctly. Specifically, the \ and ` keys are swapped over. As far as I can tell, the only way to resolve this is to install a third-party keyboard layout from "some person on the internet". Apple don't officially support it. In 2013, I took an internship as a programmer at Dutch indie studio Two Tribes. Before I arrived, they asked if I had any preferences as to the keyboard for my workstation - I replied that I'd like one in a UK layout. The UK keyboard uses the ISO layout with the large enter key (figure 1). When I arrived, I was greeted with a US ISO layout keyboard. The physical layout is the same, but a few symbols are in different places (such as the " and @ symbols being swapped). This was no huge problem for me, it's easy enough to map it as a British keyboard in software, and I can touch-type fairly competently. As it turns out, everyone else there was using the US International layout, which uses the ANSI key layout (figure 2). I tried one and discovered very quickly that it wasn't for me. The thinner Enter key was the biggest problem for me - I kept aiming my pinky finger too high and typing backslashes instead. So they would use their ANSI keyboards and I would use my ISO one. This worked well for a while until one day they needed to type in a complex password on my machine. There is nothing quite as entertaining as watching someone desperately try to type in a complex password on an alien keyboard layout, where the key inputs don't even match the symbols printed on the keyboard. I now use a German-printed ISO keyboard for my computer at home. Don't ask how that happened.